Barbara Elle Brink was the Grace Awards 2011 winner in the Speculative Fiction category with her supernatural thriller SPLIT SENSE. In 2102 her novel CHOSEN, The Amish Bloodsucker Trilogy Volume 1, finaled in that category. Barbara writes complex characters with plotlines offering a great many twists and turns, and she is skillful at adding a dash of humor. We’re glad to have her here for the first author spotlight of the year. I’m sure you’ll enjoy her poignant piece on grace filled hope. I recently followed a fellow believer’s posts, sharing her journey as she maneuvered through the last days of her husband’s life. The path she tread was rough and rocky, one step up and two steps down. Cancer was taking the father of her children, the man she intended to spend the rest of her days on this earth with, her soul mate and best friend. But even in the midst of confusion, heart-rending disappointments, tears, anger, and sorrow so great it welled up and flooded Facebook, she let the incomprehensible joy of the Lord and trust in her Savior and God permeate every fiber of her being with HOPE. HOPE remained steadfast in her posts even when darkness and despair seemed to push out all the light. HOPE held like an anchor in the storm, a tether that stretched and groaned but never broke. And someday that tight bud of HOPE that she continues to hold onto will unfold in glorious eternity with her heavenly father and those who have gone before. In this bright New Year we have an opportunity to look forward with promise, to pursue dreams, hold our family and friends close, seek God with our hearts and souls, and be that light and salt that the Word of God entrusts us to be. The Grace Awards allows Christian writers like myself a little slice of that hope. I hope to write fiction that will go out and change lives, open hearts to God’s love, and simply supply wholesome and fun entertainment to counteract popular culture trends. Hope drives us on to persevere. In this New Year let’s be filled with HOPE. In 2011 my first historical fiction, MORE PRECIOUS THAN GOLD, was a finalist in the Grace Awards. I was thrilled by the confirmation that people enjoyed my story and considered the writing good…but four years later the sequel remains half finished. Why, then, was I selected to write about writing and thankfulness? A funny thing happened on the way to publication. After I wrote my first project–a homeschool history curriculum–my brain was bursting with human interest stories I’d discovered during my research. I had a vision for any number of historical novels, but a job change for my husband meant a move and remodeling projects for me. Somehow I finished my first fiction project and started on the sequel but writing paused as our daughter married her sweetheart. Their happy day was the culmination of months of planning. As the year drew to a close, I had just time to develop a sort of “one off” project before the holidays. HOME SWEET HOLE was an enjoyable experiment that linked my passions for writing, fantasy, and sustainable architecture. I expected to get back to my historical series after New Year’s, but 2014 turned out to be the year of parental care. We lost both our fathers that year after lingering illnesses, relocated both mothers, and helped them through four surgeries. Again toward the end of the year, I wrote Nabbing Saint Nickolas–a short piece we sent in lieu of Christmas cards. I told myself I was just staying in the game. Next year would be more productive…but the next year it was our son’s turn to launch. With our nest truly empty, I turned to writing once more, but over the years my direction had changed. Stories still fill my heart, but my non-fiction homeschool resources do a better job of filling my bank account. My writing career is portable. My husband’s relocation meant the sacrifice of my “day job” but challenged me to make a switch and gave me the opportunity to commit to my writing craft. As an indie writer, I control my schedule and my deadlines. Because writers write from their own observations about life, it is good to take time for the milestones that make memories. I am free to experiment. Did I plan to write such diverse genres? No more than I planned anything else that has happened…but I have learned and grown from each experience. Writing Discover Texas developed outlining, research, and organizational skills. Writing historical fiction taught me to listen for my characters’ voices as I wrote dialogue and deep points of view. Home Sweet Hole taught me that not all projects are meant for a wide audience. I learned to enjoy the rave reviews and shrug off the complainers. Nabbing Saint Nickolas challenged me to tell a story and paint a vivid picture using few words. And the Homeschool Parents’ How-To Series is teaching me to press toward a challenging deadline and develop marketing strategies. Writing is, after all, a business as well as a passion. Each experience allows me to explore. New genres! I’ve developed more flexibility in my writing. What readers like is not always what I like, and what I thought I’d like is not always what I end up liking best. New talents! Who knew I could enjoy illustrating so much? New technologies! I am constantly forced to learn faster, cleaner, and more efficient ways of doing things, and that knowledge carries into the next project! Even though my career has taken unplanned detours, I’m thankful for each challenge along the winding road and for the freedom to explore that path and find contentment. What about you? Has your career trajectory been a straight line climbing a chart to success, or have you discovered that some “setbacks” are opportunities in disguise? 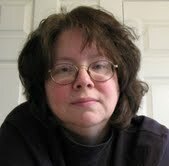 We’re thrilled to have Tina Pinson showcasing this month. Tina’s wonderful novel, IN THE MANOR OF THE GHOST finaled in the Grace Awards 2010 Action-Adventure/Western/Epic Fiction category. She’s been prolific sinnce then and has a new novel out: BETRAYED. Hard to believe it’s already October. In Colorado (a place I love), the Aspen trees are blanketing the mountains with reds, yellows, oranges, and browns — amazing how dying leaves trumpet such beauty. Because October is Clergy Appreciation Month, I would like to introduce you to my father. Vernon Grover. My father was born in October 1935. He grew up on a farm/ranch. He joined the Marines out of school, and traveled to the Orient and Pacific islands. After a short stint, he got out and went home to Colorado. There he met and married my mother. Then dad joined the Air Force and we all traveled. In Alaska he accepted Christ as his Savior. He began to teach and over time went into preaching. He pastored in Opheim, Montana. Our family was half the congregation. Dad’s last church was in Norwood, Colorado. He built the parsonage for the Baptist Church there. The picture window looks out over a large pasture and takes in Lone Cone Peak. He also taught shop there. Dad was determined, but problems arose because of wrong property lines, and a shortage of workers. My husband, sons, and I would travel up to help. After two years, dad left Norwood. His heart couldn’t take it. Save for finishing touched, the house was built. Dad died in July of 1994. He didn’t regret building the parsonage. He gave his all for what he believed and in the process taught me oh so much. He didn’t get to see me published, but he encouraged me to keep writing. And I have. I have 11 published books and am working book three in my Trail of the Sandpiper series. Book 1, BETRAYED just released in August. In the Manor of the Ghost was my first published novel and a finalist in the Grace Award’s. It’s the story of Kaitlin Dupree and Devlin Clayborne, who marry for convenience and find love. It’s the story of a Ghost that walks the halls of Clayborne Manor, and the ghost of regrets and secrets that haunt the manor and Devlin. Kaitlin prays love and grace will help her uncover the secrets of those living in The Manor of the Ghost. It’s the summer of ’42. The world is at War and Japan’s Imperial Army is moving across the island of New Guinea. After their mission is attacked Justine is left with seven children to lead to safety through enemy lines. She leads them to a cave and goes back for her husband when she is taken captive. Upon her escape with the help of a friend, Virginia, she starts back for the children and runs into Lt. Tyler Merrick. She hopes he will help her. But he’s drunk and doesn’t believe there are children. He thinks Justine is the rogue spy he been sent to find. Justine goes for the children and returns to an even angrier Lt. Merrick. He wants to tie her up. She hopes to win his trust. Because… if they can’t stop fighting one another, they will never get off the island alive. In Genesis 1:14, God said, “Let there be lights in the firmament of the heaven to divide the day from the night; and let them be for signs, and for seasons, and for days and years.” In this passage, “seasons” refers to “appointed times or festivals,” not the more familiar meaning of spring, summer, fall, and winter. Seven festivals or appointed times are celebrated by the Jews—but they are not Jewish appointed times; they are God’s appointed times. Unfortunately, when Constantine changed the official calendar from a lunar calendar to a solar calendar, our “Christian” holidays merged with pagan holidays. In the process, Christianity absorbed many pagan traditions. For example, Christians celebrate the resurrection of Yeshua at Easter. Historically, this day coincides with a pagan holiday going all the way back to the days following the flood and the Tower of Babel. Easter, because it is set according to the spring equinox, is often days apart from Passover and the crucifixion of Yeshua. Only recently did I learn about God’s appointed times. It is, in fact, through God’s appointed times we know when Yeshua will return. As Yeshua fulfilled the first four festivals at the time of His first coming, so will He fulfill the remaining three feasts at His second coming. While we are not obligated to keep the festivals in the church age, knowing what they mean has enriched my Christian walk. When I think of the blowing of the shofar, for example, the sound reminds me of the rapture during the Feast of Trumpets. In fact, all around the world, in recent years, people have heard mysterious trumpet-like noises coming from the heavens. You can hear these sounds on YouTube by clicking here. Feast of Passover – Fulfilled at Yeshua’s first coming. Yeshua is the Passover lamb. His sacrifice occurred at the very hour the high priest slaughtered the lambs within the Temple. Feast of Unleavened Bread – Leaven is a picture of sin in the Bible. Yeshua was in the grave three days and three nights following His crucifixion as the unleavened, spotless Son of God. He was the perfect sacrifice for our sins. Feast of Weeks (Pentecost) – Occurred fifty days after Passover. On Pentecost, Peter preached from Jerusalem and 3,000 people responded to the outpouring of God’s Holy Spirit, sparking the beginning of the Church Age in which we now live. Feast of Trumpets – While the fulfillment of the first four feasts occurred at Yeshua’s first coming, most Bible scholars believe the last three will be fulfilled at His second coming. The Feast of Trumpets is the first of the fall feasts. Many believe this is the feast when Yeshua will rapture the church from the earth. In I Thessalonians 4:15, Paul wrote, “For the Lord Himself will come down from heaven with a mighty shout and with the soul-stirring cry of the archangel and the great trumpet-call of God. And the believers who are dead will be the first to rise to meet the Lord. Then we who are still alive and remain on the earth will be caught up with them in the clouds to meet the Lord in the air and remain with Him forever.” Let us remember that the Jewish New Year, also known as Rosh Hashanah, begins on the first day of Tishrei. In 2015, that occurs on September 13 at sundown. The first day of the Jewish New Year is the Feast of Trumpets. While we do not know the exact date of Yeshua’s return, that day is fixed as an appointed time. If you look at the signs Yeshua gave in the Olivet Discourse in Matthew 24, He tells us what signs to look for that would mark His return. He wanted us to prepare for His coming. In Matthew 25:1-13, in the parable of the ten virgins, He warns us what would happen if we didn’t. Feast of Tabernacles or Booths – Looks ahead to when Yeshua will reign from Jerusalem over all the earth for one thousand years. (Micah 4:1-7). As the return of Yeshua draws near, I find comfort in knowing that the Feast of Trumpets on September 13, 2015 may be God’s “appointed time” for the rapture. Knowledge of God’s fixed days brings peace. Even though the Gentiles have altered the calendar and forgotten God’s appointed times, God never changes. His return is set—if not this year, maybe next year—in 2016 or 2017 or 2018. Regardless of the year, when autumn draws near, I remember—and hope, this is the year. God’s appointed times are highlighted in Lorilyn Roberts’ award-winning historical fantasy series, Seventh Dimension. To learn more, visit http://LorilynRoberts.com. The first book, SEVENTH DIMENSION – THE DOOR, A Young Adult Fantasy, is free on Amazon. We are so blessed to have Elaine Marie Cooper here for our November/Thanksgiving spotlight Elaine’s THE LEGACY OF DEER RUN finaled in the Grace Awards 2012. 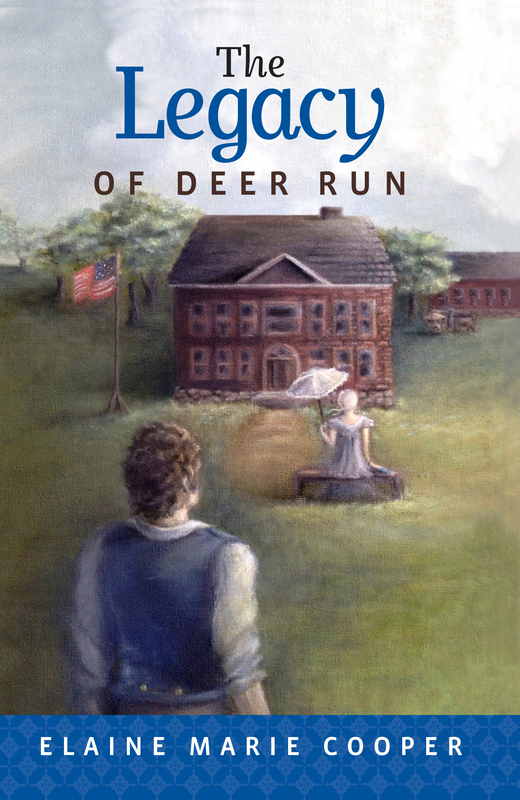 When thinking of novels with themes of thanksgiving, selflessness, gratitude, and sacrifice, Elaine’s entire Deer Run series, set during the American Revolutionary War era, comes to mind. As an author of novels set in Colonial Massachusetts—where Thanksgiving was THE holiday of the year—I have a personal, culinary dilemma. In my holiday scenes, I’m supposed to describe feasts for a large family in such a way that my writing seems as natural as Paula Dean in a Southern kitchen. The truth is, when it comes to planning and executing a banquet in real life, I feel like a fish out of water. When I am the only one available to cook the turkey, stuffing and sweet potatoes, my anxiety level can exceed the red zone of hypertension. That’s why it was so easy for me to describe the character of Susannah Dobbins in THE LEGACY OF DEER RUN as she fretted about Thanksgiving dinner. Fortunately for Susannah, she had guidance from the housemaid named Modesty, whose cooking skills far exceeded her social ones. 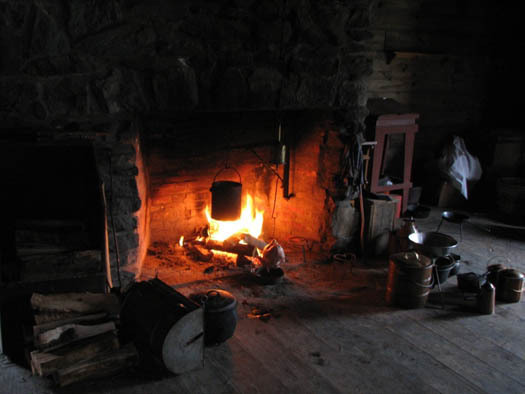 Modesty tutors the helpless Susannah in the art of cooking, helping the inept, somewhat-spoiled Susannah become competent at cooking chicken over an open hearth and baking pies in a wood-heated oven that required keeping the temperature just right. Susannah scanned the room nervously. “What am I forgetting? “I think you’re forgettin’ to breathe, miss.” Modesty threw her head back and gave a hearty laugh as she returned to beat the egg whites for the green corn pudding. “I am frightfully nervous. My last cooking endeavor was a disaster.” Susannah rolled her eyes at the memory. The outcome, however, turned out to be a sumptuous feast as Susannah’s suitor, father and brother relished the meal. Success for the fretful Susannah! So where is a “Modesty” when I need one? Well, one Thanksgiving meal was a tremendous success—because it was cooked to perfection and displayed in beautiful array by my daughter-in-law, Kristen. 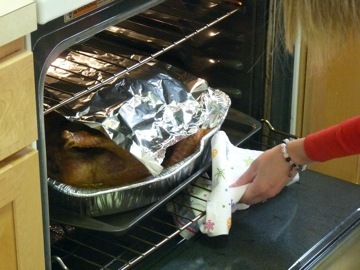 She and my son, Ben, were living in Virginia at the time, and Kristen put on a display of sumptuous turkey with all the fixings that would leave you begging for seconds. 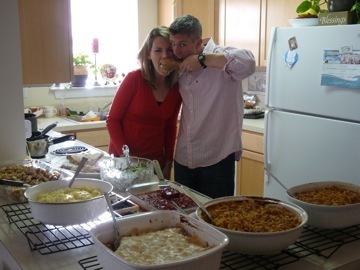 I’m not too proud to admit it: My daughter-in-law is a far better cook than I am. My son is a blessed man. So rather than wallow in self-pity about my lack of cooking skills, I think I’ll admire the delicious offerings of those more skilled than I in the kitchen, help clean up the dishes—and plan another novel at my laptop. As Christians we know that the supernatural world—a world “where trees clap hands” and “God’s voice sounds like thunder,” as Bible teacher Beth Moore has said—is as real as the natural one, and I’m convinced we all have a deep, God-given need to experience the supernatural in our ordinary lives. We long to see what Elisha’s servant (2 Kings 6:17) saw when he had his eyes opened by the Lord and looked up to see the hillsides around him filled with horses and chariots of fire. At least in our braver moments we do. In my twenties, even though I was a Christian, I was drawn to the fast-food side of the supernatural. As much as I longed for a taste of the invisible world I believed was there, I never experienced it through Christianity. But I wanted it. So I played around with wicca and studied “alternative paths”—from Celtic neopaganism to astral projection. All the fun (and pretty) stuff. The stuff without God attached, since an encounter with God would have required something of me I wasn’t prepared to give at that time. As a result, although I have strong, negative opinions on wicca, neopaganism, and the new age, I have nothing but empathy for young people caught up in those beliefs. I understand what draws them because it drew me too. And I know that someone trying to connect to the supernatural through wicca is far closer to God than he or she may realize. Needless to say, I’m no longer involved in wicca, so this passion of mine—to expose wicca and similar beliefs for the danger they are—found an outlet in my mystery series. I knew I had to throw the heroine of the series, Anna Denning, into situations where she would have to deal with people—some of them villains, some not—who followed these paths. Witches, wiccans, neopagans, spiritualists, new agers who believe in ghosts—and I’m just getting started. The Grace Awards is about to embark on a new adventure by “spotlighting” past winners and finalists so we can find out what they’re up to and where their writing journey has taken them. We’re delighted that our first author is Karin Kaufman, an amazing author who’s debut novel THE WITCH TREE finaled in the 2011 Grace Awards in the Mystery/Thriller/Romantic Suspense category. Since All Hallows Eve, Halloween, and All Souls Day are approaching, we think it’s extremely appropriate that Karin will be sharing with us for two days as her new novel is entitled ALL SOULS. Earlier this year I took a break from writing my Anna Denning Mystery series to write a novel called All Souls, the first book in my new Gatehouse Thriller series. With much trepidation. So much so, in fact, that when I finished writing it, I published the book under the name K.T. Kaufman. Not only had I never before written a thriller, but I decided that this time I’d let it fly. I’d write what the story called for. I’d write what was in my heart, regardless of the spoken and unspoken rules of Christian fiction and despite the strong possibility that, because of its language and violence, my book would offend some readers of my mysteries. I’m not a cool Christian. I’m not a hipster who tries to tweak other Christians’ noses and push the boundaries because, hey, Jesus was a rebel, man. I’m just not. I take using “bad” language and portraying violence seriously. And I didn’t set out to use bad language in All Souls because I thought that’s what edgy Christian fiction writers do or some such nonsense. I didn’t plan the language of the book at all, except that most of it would be in first person. But I found as I was writing it that bad language was called for in places. Who said it and when it was said—and most of all, who restrained from using it—had a purpose. Because I plot before I write, I knew the basic outline of the story before sitting down at the computer, but part way through the book, as I let the story develop in its unconstrained way, it changed. It became something I hadn’t fully intended: a story of what it costs one soul to forgive another—a more Christian story than I believe I could have written had I been mindful of the rules.